Outdoor Hockey comes to Frontier Field in December with the Greater Rochester Area Honda Dealers Frozen Frontier presented by Labatt. Tickets for the Greater Rochester Area Honda Dealers Frozen Frontier presented by Labatt are on sale now. Complete ticket information and previous coverage/press releases below. . If there are any changes to Sunday's high school hockey schedule, they will be posted on our official facebook page, Facebook.com/RocRedWings and our official twitter page @RocRedWings. If you don't see any updates on our Facebook and Twitter pages, everything is taking place Sunday as scheduled. Thanks. Every effort will be made to play the games on the days they are scheduled, The officials from Rink Specialists will make the final decision on whether the rink is playable due to any existing or forecasted weather conditions. The main (Morrie Silver statue) gates will be open, the Plymouth Ave. gates will not be open. One ticket purchase gets you entry into any/all of a day's games, however once you enter there is no re-entry without the purchase of an additional ticket. Please call 423-WING (9464) if you have any questions about the ticket and entry policy for the Section V Rivalry Days Dec. 21-22. Mama Mittsy's Pizza by Salavatore's will be open (near main entrance), as will the Labatt Blue Zone chalet in left field. The Blue Zone will offer hot dogs, pizza, burgers, soda, hot chocolate, coffee, and Red Osier sandwiches. Beer will not be available on Dec. 21-22. The Red Wings Ticket Office at Frontier Field will open at 10 am on Dec. 22 for Section V Rivalry Day ticket sales, in person or at (585) 423-WING (9464). Tickets for Dec. 22 can be purchased online using the links below. Tickets will not be available for purchase at the Blue Cross Arena. Tickets for the Dec. 21-22 Section V Rivalry Games can be purchased online by clicking here. Tickets are just $10 across all levels for the Section V rivalry days. Please note: only one ticket ($10) is needed per day for the high school hockey games Dec. 21 and Dec. 22. However, there is no re-entry once you leave on Dec. 21-22, unless you purchase an additional ticket. 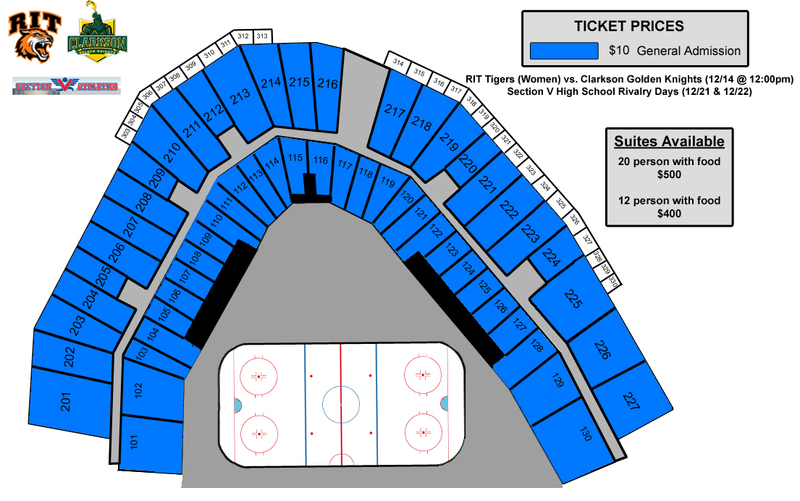 Click here to see the Section V rivalry days seating diagram. Official merchandise: click here to purchase Frozen Frontier merchandise online. You can also purchase Frozen Frontier merchandise Monday-Friday between 10 a.m and 4 p.m. at the Red Wings Team Store at Frontier Field. The Team Store will also be open on Sat. Dec. 21, 10 a.m. until 2 p.m. ... and Mon. Dec. 23, 10 a.m. until 5 p.m.. Call (585) 454-1001, ext 3056 if you have any questions. Updated ice rental times and costs Packages for ice rentals and corporate events are both available and offer the chance to skate on the outdoor ice rink at Frontier Field. Bring your hockey team out for a practice or game, or utilize a block of ice to create your very own open skate for you and your guests.